Hood is partnering with Google to offer an Applied Computing Series designed to teach computer science and data science to students who may not have previously considered entering tech. The new campus residence hall received final approval, and construction is scheduled to start in June. Former Anonymous hacker Hector Monsegur delivered the Cotton Cyber Series lecture. The Student Government Association gave back to the community with its annual Easter Egg Hunt. President Chapdelaine was named to The Daily Record's 2019 Top 100 Women. Headline: Andrea E. Chapdelaine, Ph.D. Professor Xinlian Liu is part of a team using machine learning techniques and mathematics to suggest best-practice strategies for suicide prevention, especially among veterans. Senior Maisha Khan won the Maryland Portz Award, which honors the top honors student in the state. Ceramics instructor Phil Berneburg was featured in a podcast in which he discussed projects he has worked on and the different aspects of ceramics. The new cybersecurity and informatics lab is officially open for classes. April Boulton, Dean of the Graduate School, presented about the importance of honeybees and why we must protect them. The Frederick Symphony Orchestra performed a concert on campus..
Jody Olsen, director of the Peace Corps, gave a talk about the organization and her experiences in it since 1966. Rick Roth discussed the differences between signatures and pattern analysis when trying to detect cyber attacks. Mary Shoemaker ’64 was named the 2019 Outstanding Woman of the Year by the Waynesboro/Augusta Woman's Club in Fisherville, Virginia. A Young Writers' Conference will run on campus from Aug. 5 to 16. Hood professor will lead the workshop, and there will be guest writers and community readings. Professor Sang Kim was cited in a story about the future of Washington, D.C., and Maryland's economy. Hood conducted its first ever active shooter drill to create situational awareness and improve campus safety. The third annual Green Neighbor Festival beings April 29. The early-bird deadline for vendors is March 1. Alumnus Bruce John Walz, M.A.’82 was named to the Mount Airy Hall of Fame. Madina Franklin ’20, vice president of Hood’s Black Student Union, spoke about why black history is important during Urbana High School’s 3rd Annual Community Black History Program. 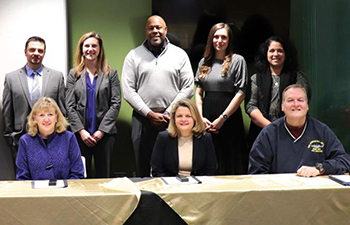 Hood College signed a Memorandum of Understanding with Fort Detrick to build a pathway for active duty military personnel to take reduced-tuition graduate courses. The Frederick Food Security Network has helped produce more than 1,500 pounds of food for those in need in Frederick County. Area high school students attended the Model United Nations conference at Hood College to discuss real-world responses for potential situations and crises. Professor David Gurzick was quoted in a Frederick Magazine story about the "Gig Economy" and how the work landscape is changing. Professor David Hixson was quoted in a Forbes story about the effect of the government shutdown on the National Park Service. National scholar C. Nicole Mason visited campus on MLK Day to discuss the impact of race, class and gender on public policies. The Frederick Food Security Network won the Chesapeake Bay Trust's 2019 Melanie Teems Award for environmental engagement. 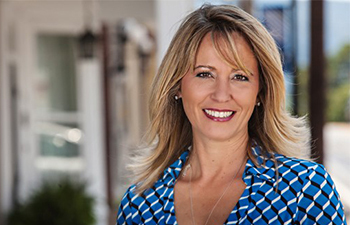 Alumna Sarah Marshall and her family were featured on the HGTV series "House Hunters" when they searched for and bought a house in Frederick. Artist Taurean Washington, a 2012 alum, was profiled in the Baltimore Sun. The Frederick Food Security Network won an award for environmental engagement. Martha Church, the first female president of Hood College, died and left behind a significant legacy. Student Taylor Polito is the marketing and social media coordinator for the nonprofit Platoon 22. She was quoted in a story about an equestrian fundraiser for her charity. The Center for Coastal and Watershed Studies launched the Frederick Food Security Network as part of a growing project to bring fresh produce into communities that are currently food insecure. Hood College has partnered with several organizations including the Frederick Innovative Technology Center and the Frederick National Laboratory for Cancer Research to develop the Community Growth Accelerator Technology Development Program, which aims to help young entrepreneurs with startups and business savvy. 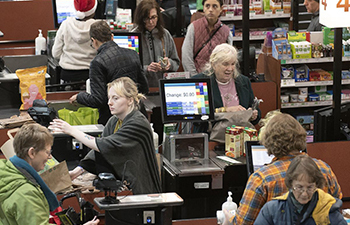 Connie Ray, manager of the Frederick Food Security Network, explained how a Common Market location in the old Safeway location would remove a food desert and help that area of Downtown Frederick. 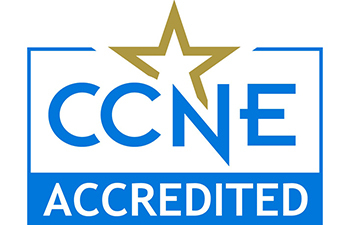 The Bachelor of Science in Nursing program has received 10-year accreditation from the Commission on Collegiate Nursing Education (CCNE) and is now fully accredited through 2028. 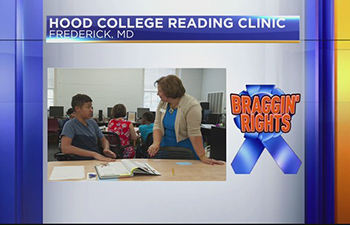 The Summer Reading Clinic earned a spot on WDVM’s Braggin’ Rights for receiving an $18,000 grant from Delaplaine Foundation, Inc.
Alumna Kelly M. Schulz has been named secretary of the Maryland Department of Commerce. She previously served as secretary of the Maryland Department of Labor, Licensing and Regulation since 2015. The Board of Trustees appointed eight new members at its October meeting. Alumnus Paul Mantello ’05, MBA’16 was hired as town manager in Boonsboro, Maryland. Hood College has been granted $100,000 by the Hearst Foundations to enhance its Summer Research Institute (SRI) grants. A new residence hall will begin construction in spring 2019 and will be ready for students in fall 2020. Alumnus Taurean Washington creates series of paintings inspired by hip-hop albums. His most recent exhibit was “Black Butterfly” at the Delaplaine Arts Center in Frederick. Hood is hosting the Maryland Student Legislature fall session, which will include seven colleges and approximately 50 students. Professor Elizabeth MacDougall was a guest speaker at the Alzheimer’s Association Western Maryland Dementia Conference on Nov. 13. During her sabbatical, MacDougall has been researching the relationship between religion, spirituality and mental health in informal dementia caregivers. The Enactus Club was featured in WDVM’s Braggin’ Rights for preparing 400 care packages for the Frederick Rescue Mission. Hood College has been granted $120,000 from the U.S. Department of Education to bolster its Arabic and Middle Eastern studies program. Funds will go toward curriculum improvement and experiential learning. Hood’s new residence hall will be the first constructed since 1965. Criminal justice professor Teresa Bean led a session on Digital Dirt at a recent Frederick County event that allows students to interact with local law professionals. She engaged students in discussions about online privacy, smart phone addiction and recent studies showing a causal relationship between time spent on photo-sharing apps and mental health problems. Hood College hosted a Transgender Remembrance Day to raise awareness of transphobic acts and honor those who have lost their lives. International advocate and trauma survivor William Kellibrew gave a presentation at Hood about male victims and witnesses to sexual abuse and domestic assault. Hood hosted a “Reality Fair” for high schoolers in Frederick County. The fair explained how to budget money, what types of expenses to expect in the future and how life events can impact their financial situation. Hood College hosted its 15th Annual Sonia Kovalevsky Day for high school girls. Approximately 60 high school students and teachers participated. Professor Hoda Zaki was quoted in a story about the rise of unaffiliated voters in Frederick County. Hood College hosted a “Faces of Frederick” event during which students and local officials discussed diversity and inclusivity in Frederick County. Hood is hosting a film screening of “Food for Change: The Story of Cooperation in America,” a documentary that explores the role of food co-ops and their influence on organic food and regional food systems. Laura Russell Thompson, a 1981 Hood alumna, was recognized for her work in sharing and sustaining African-American history in Orange County, Virginia. Professor Terry Anne Scott was on WYPR’s Midday with Tom Hall to discuss connections between hate speech and hate crimes. Her introduction is from 7:07 to 9:20, and she speaks throughout the broadcast. The National Science Foundation has awarded Hood College $650,000 for STEM scholarships. Hood College’s dual enrollment program emphasizes giving high school students a taste of the college experience on campus. Professor Erin George was quoted in an article about raising the statewide minimum wage to $15 per hour. In the 10th Annual Walk Strong event, members of the Hood College community walked a mile through the rain to raise awareness of and money for the Frederick Rescue Mission. CARE project coordinator Nina Carr and Dean Olivia White were featured on WDVM’s Sunday Newsmaker show to discuss Hood’s new sexual assault prevention initiative.